As a child psychologist, I’m committed to empowering children with learning disabilities to succeed in school. Dealing with a learning disability is a journey, and I am dedicated to supporting my clients and their parents during this time period and beyond. I want your child to get the help he or she needs to succeed in school, and I know that’s what you want as well. My neuropsychological and psychoeducational testing services don’t end with our feedback meeting. I don’t consider my job to be done once the evaluation results are provided to you. At the testing feedback meeting, I’ll answer any questions you may have, and I may recommend seeing a pediatrician or a psychiatrist if a medication consultation is indicated. I’ll provide strategies for you to employ at home with your child, and resources for you to get more information. We will review the type of services, ways of teaching, assistive technology, and other support that may benefit your child. We will also go over what happens at the first Individualized Education Plan (IEP) or 504 Plan meeting with your child’s school support team. Let’s take a look at these two terms: IEP and 504 Plan. Section 504 of the U.S. Rehabilitation Act of 1973 is designed to help students with physical, mental, or emotional impairments in public schools (or publicly funded private schools) using accommodations that can be carried out in the classroom. These 504 Plans ensure that students will be treated fairly at school. The goal of 504 Plans is for students to be educated in regular classrooms, along with the accommodations or educational aids they may need. 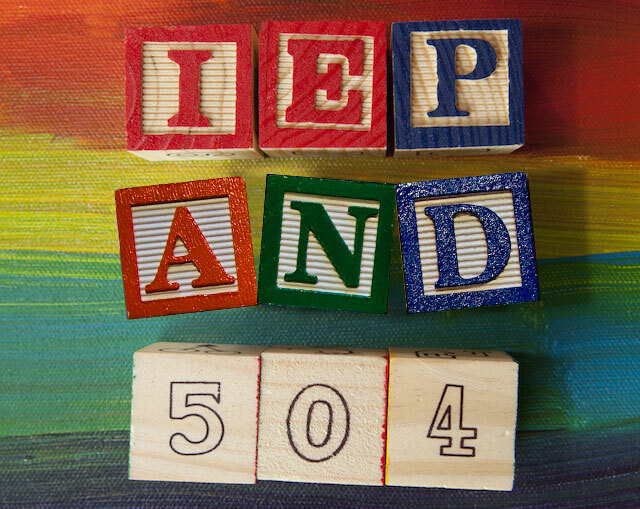 A 504 Plan is different from an IEP. The main difference is that a 504 Plan modifies a student's educational program in a regular classroom setting. A 504 plan is monitored by classroom teachers. A student with an IEP, as part of the Individuals with Disabilities Education Act (IDEA 2004), may receive individualized educational services in a special or regular education setting, depending on the student's need. IEP programs are delivered and monitored by additional school support staff, and parent approval is required. As you can already tell, the IEP/504 meeting is often quite complicated and can be overwhelming for parents. One of the things that makes my practice unique is the extra steps I take to support you and your child beyond the testing phase. One of these steps is accompanying you and your child to his or her IEP/504 meeting. This way, I can speak to my testing findings and recommendations; consult with teachers, special education staff, and administrators; and provide support for you and your family. I also make myself available to consult with therapists, teachers and others on an as needed basis. My role is to help you, as parents, navigate the educational system and embark on a path to success for your child. I've participated in a variety of meetings at the elementary school, middle school, and high school level in multiple school districts. I have also visited many schools in the area for child observations, which is a component of my testing process for young children. Through these visits, I not only learn about the particular child I am observing, I also become familiar with the different school settings and administrations. I’m committed to making sure you understand your child’s results and am here to help you navigate the next steps. I look forward to working with you and your child. Next month, we will look at what to expect from the first IEP/504 meeting and how to prepare for it.